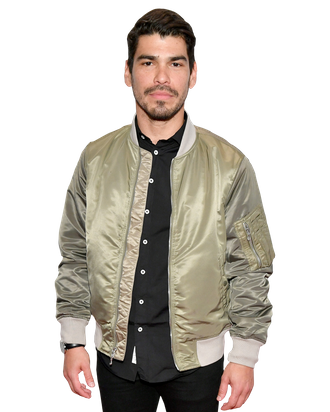 Raúl Castillo is, in short, a heartthrob. And his face is likely familiar, thanks to the fact that he’s bounced around a lot of your favorite TV dramas: He starred in two seasons of the HBO drama Looking, an episode of Netflix anthology Easy, and had arcs on the Regina King crime drama Seven Seconds as well as Atypical, about the coming of age of a teenager on the autism spectrum. Now, Castillo has his first big role after being Looking’s breakout: In an intimate family drama called We the Animals, Castillo has turned in one of the most moving performances of the year. As Paps, Castillo is the father to three boys: the sensitive, creative Jonah (Evan Rosado) and his two rambunctious older brothers, Joel and Manny (Josiah Gabriel and Isaiah Kristian). Paps is at times playful and heartbreaking, at other times brutal and harsh. The boys, Jonah in particular, are trying to make sense of their complicated father: he hits their mother, but they love each other; he can’t control his temper, but he can dance with them in the kitchen before breakfast. We the Animals — directed by Jeremiah Zagar and based on Justin Torres’s novel of the same name — is Jonah’s story about being young and queer and coming of age in a troubled family. (The film has received with more than one comparison to Barry Jenkins’s Moonlight.) Paps is where a lot of the family’s troubles start, but the boys love him fiercely. Castillo talked to Vulture about We the Animals, his own coming of age, and figuring out how to be a man growing up in Texas. So much of this movie is about boyhood, and family. What were you like when you were 9, 10, 11, growing up in Texas? A lot like Jonah. In my family I’m known as the crybaby. I’m in the middle. So, I’m starving for attention — it makes sense I’m an actor. I was very sensitive and very empathetic, but growing up in the really masculine environment that’s Texas, that’s northern Mexico. Machismo is a huge part of the culture in both places. So I knew a little bit about what it means to be a sensitive soul in a really machista environment. Sure, in a place that might not be as attuned to that. That’s right. Luckily, I grew up with parents who didn’t brutalize it out of me. I wouldn’t say it was encouraged, but it wasn’t shamed the way it often is in people. Thank you. But, I had a great relationship with him. I think my dad was a lot like Jonah, in a lot of ways. He was the youngest of three boys. I think his father was a lot like Paps and I think he was always trying to figure out how to navigate that machista environment. My parents were just trying to figure it out. At the end of the day, I’m so lucky that they just loved the hell out of us, and wanted nothing but good things for us. They weren’t perfect, they were trying to figure it out; they were using the tools that they were given, which weren’t much in a lot of ways. My dad passed away the year that Looking came out, and he got to see me do that. We had the same name, I’m a junior. I think him seeing his name in the credits — he was very proud of that. Can you tell me about meeting the boys for the first time? I know that it took a while to cast them. When I got cast, or when Jeremiah [Zagar, the director,] sort of loosely offered me the role, they hadn’t found Evan yet. The production company wouldn’t sign off on other parts until they found their Jonah. Rightfully so; I mean, you’ve got to start with the main character and then build around there. But I had read for him and Justin [Torres] and I didn’t ever [think] in a million years they were going to cast me. I’m kind of embarrassed about this, but I walked in with a buddy of mine, who I love, a real talented actor. I was like, “Ah, dude. This is you.” I was telling him that and I meant it sincerely, “This is your role.” When they cast me, I felt like an idiot for having said anything like that. But I think he understood. Do you remember the first time you read with Jonah? I think it was that winter of 2016, we met in the Public Record offices in Gowanus. It was me, Sheila, and all three of the boys. It was great because the three of them were non-actors; now they’re actors with agents. They’re big time! Deservedly so, they were all so great in this. The three of them are so special and they brought so much to their roles. The three of them did. They really formed this bond and brotherhood. I’m so proud of them because it wasn’t easy. They would watch us — Sheila and I — and see how we work. Neither Sheila nor I are parents, but it gave us an opportunity to be parents for a summer. When I talked to Jeremiah a few months ago, he said you and Sheila lived together during filming, and that the boys also stayed together. I was so curious about that. What was that experience like for you, living together as a family? Sheila and I got a lot of time to hang out before that even, just getting to know one another and spending a lot of time with the boys. It was really invaluable cause you don’t normally get to experience that. A lot of times you’re meeting people on the set. Having had that, there was a lot of anticipation, but then you sort of have to throw — you throw it all out when you start rolling. Two nights before we started shooting, we had spent the night together as a family in the house: it was Jeremiah, Zak [Mulligan], our DP, the boys, and Sheila and I. We improvised some scene around the campfire, just for ourselves. The boys had their first real fight as brothers that night. They were just starting to get on each others nerves, I think. There was a bit of a mutiny, you know, “What if I don’t want to be in this film?’”Oh snap! Okay, let’s have that conversation. They never acted before, so I think they were trying to learn what the rules were. But I think that’s what being a family is, right? I think everyone’s parents are just trying to figure it out and you don’t realize that as a kid. You think there’s already rules. So how did you, as a family and as a cast, help them through that? I think Sheila read from the novel to them. They were in a creaky old house and scared. They’re city boys, they’ve never been out in the country, so they were nervous. My favorite scene in this is when Paps is fired for letting the boys come to work with him. On the way home his truck breaks down. A bad day gets so, so much worse, and he’s with his sons and they’re in the bed of the truck being driven home. What can you tell me about that scene? Jeremiah likes telling this story but he always remembers this: we shot pretty chronologically, so it was late in the process when we got to that truck scene. There’s so much going on, it’s chaotic. Finally we’re moving and we’re getting into the scene; the truck’s broken down, he’s having this crisis. The boys are watching me, and the three of them really became actors. Josiah playing Joel, little brother, he was learning to cry watching me go through this experience as this character who’s weeping. They wanted to mimic me, so they were trying to manipulate themselves. Josiah wanted to learn to cry and he did it. He was able to make himself do it. That’s what’s so wonderful about the scene, is that they sense that something bigger and more hopeless is happening, but they’re not exactly sure how to react or what to make of it. They can’t really meet your energy in that scene, so they’re mirroring it. Yeah, that’s it. Especially for a scene like that, I just have to really focus and I know what I need to do to get to that point, so it was funny just watching them cause I wasn’t joking with them, I wasn’t as playful with them as I was on other days. They knew that something was going on, and yeah, you’re right. You’re absolutely right, that’s that moment in these people’s lives. That was also the first scene where I started to consider how Paps must feel as a probably one of the only men who isn’t white in this small town. How isolating that is, outside of his family. Speaking of us both going to school in Boston, right? Yeah, absolutely. We were up in Utica, it’s 2016, it’s right before the elections. Trump signs were everywhere. I grew up in Texas so I know what that is. How it feels. In a lot of ways it’s not scary for me, because I know how to navigate it. I’ve been through it my whole life. Congratulations on the Indie Spirit nomination. Does the awards circuit feel a little surreal, or a little daunting? Yeah. I ran into a friend, Yolonda Ross, who I’ve known for many years. We were members of Labyrinth Theater Company here in New York and we ran into each other on the red carpet for Indie Spirit Award nominations. Yolanda’s been a past nominee and we’ve done readings of plays in little dusty rooms in upstate New York together years ago, and now we’re on the red carpet. Indie Spirit Award nominations luncheon … that’s a trip, when you’re coming up together. My buddy Brian Tyree Henry was hosting the luncheon on Saturday. I was just thinking it’s so weird that the people that you came up with together — that you’re now up there doing the things. And that always excites me. I’m doing the second season of a show called Vida that my friend Tanya Saracho wrote and created and that really trips me out, just the people that I came up with doing it. That’s really exciting when you’re up there together. That’s the part that makes me giddy.